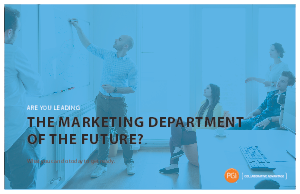 > PGi > Are you leading the marketing department of the future? The future of marketing will require brands to market “with” buyers, not “at” them. Marketers must strategically and holistically think about how to invite buyers, colleagues, stakeholders, teams and even competitors into the marketing process. And once they have captured the attention of these audiences, they must engage them in a way that is less self-serving, more collaborative and, above all, more relevant to the individual’s needs.